Designing merchandise for a cultural heritage exhibit can be tricky. There are many issues to navigate, but ultimately the purpose is to encourage increased engagement with the exhibit themes and material with the hope that it will help increase understanding of other cultures and the past. 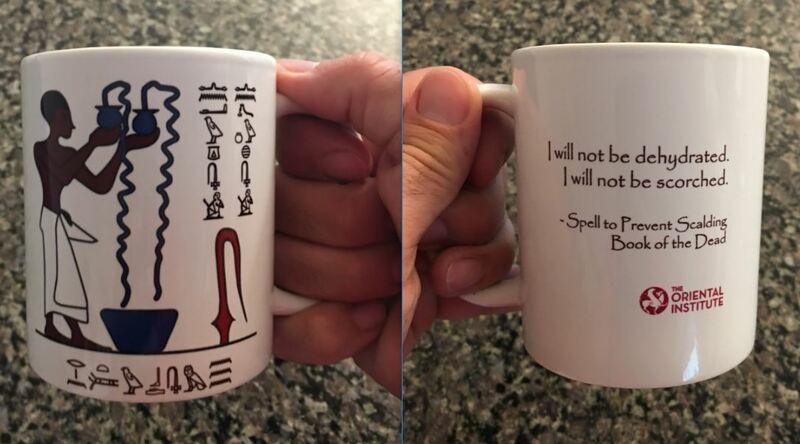 For the exhibition Book of the Dead: Becoming God in Ancient Egypt, running at the Oriental Institute Museum from October 3, 2017, to March 31, 2018, the Suq museum store will be selling a limited amount of themed merchandise, including a fully illustrated catalog of the exhibition, a coffee mug with a Book of the Dead spell to prevent scalding, a t-shirt, a magnet, temporary tattoos, and a set of bookmarks, among others. Focusing on the ancient Egyptian objects in the public exhibition was a priority during the design process. We made an attempt to use images and text directly from the materials in the exhibit. We also wanted to avoid using images of any human remains. Each of the items comes with explanatory material so that that purchasers will know the cultural context and importance of the designs they take away on their souvenirs.